Spring has sprung, which means it’s time for spring cleaning! 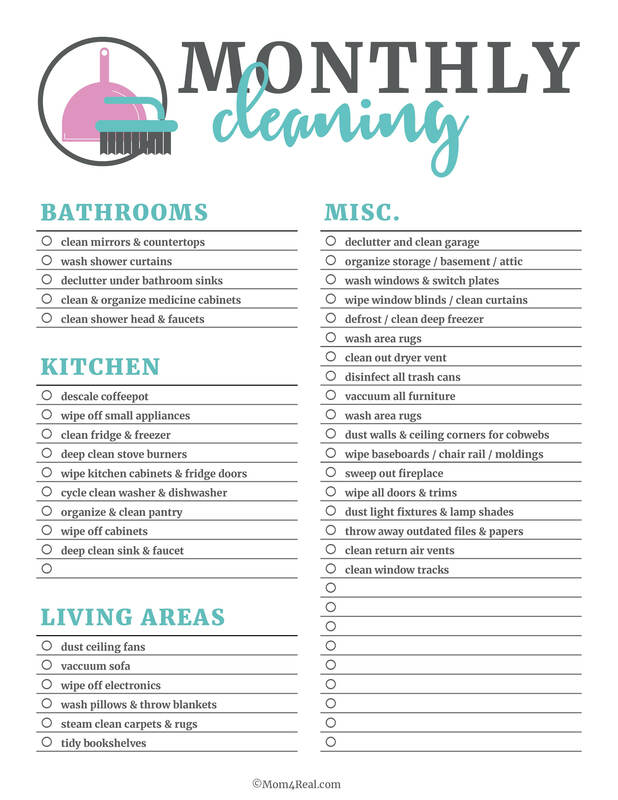 These printable cleaning checklists will make cleaning your home daily, weekly and monthly a breeze! Just print them off and check as you clean! I’m not sure what the fascination with spring cleaning is, but I definitely catch the bug at the first site of spring blooms! All of the sudden, the urge to clean every single square inch of our home overwhelms me, and I turn into the crazy cleaning lady. It may be because the first time the sun truly shines in our windows, I can suddenly see all of the spots that I must have missed when cleaning during the winter, and suddenly I feel like we may be the dirtiest people ever. I know it isn’t true true, but that’s how it feels the first time a stream of glorious sun shines through the windows directly onto the front of our stove. All of the sudden I can see the drips of sticky liquid on the front of our oven, and the dust that seems to have settled everywhere. That feeling of everything being dirty and needing cleaning can be really overwhelming. One of the way to make cleaning a bit easier is to have a checklist of items that need cleaning. 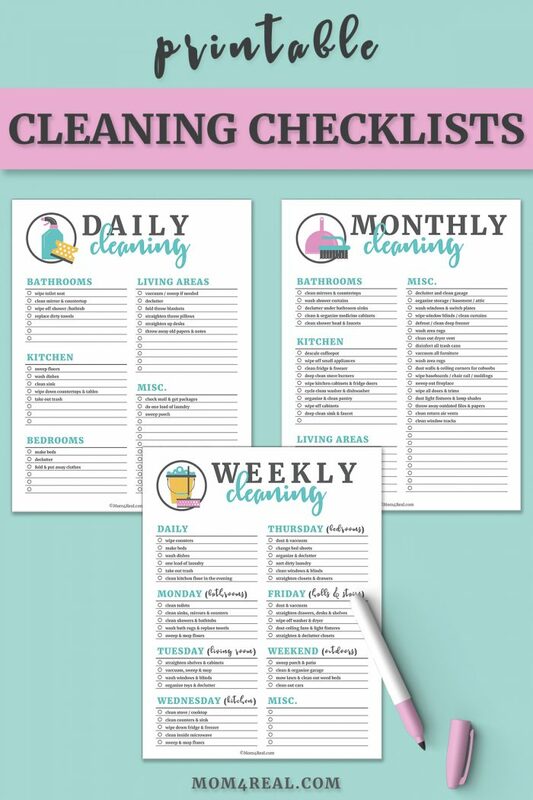 I want to share 3 free printable cleaning checklists with you today! Simply click on any of the lists to print them all! They are absolutely free, and you can print as many as you like. If you want to be able to re-use your checklists, you can laminate them and use a dry erase marker to check items off of your list! Daily cleaning can seem tough, and I know we are all busy with taking care of kids, working and living our lives. The Daily Cleaning Checklist is more of a guideline that a must do for everyday. Use this list as a guide to get what you can done, and if you can’t get all of these things done daily, no worries! Some of these things are fine if done every few days. I use this checklist as a reminder and do what I can when I have the time! Also, don’t be afraid to ask your kids to help with some things…you’d be surprised how much they’d love to be able to check something off of your list for you! 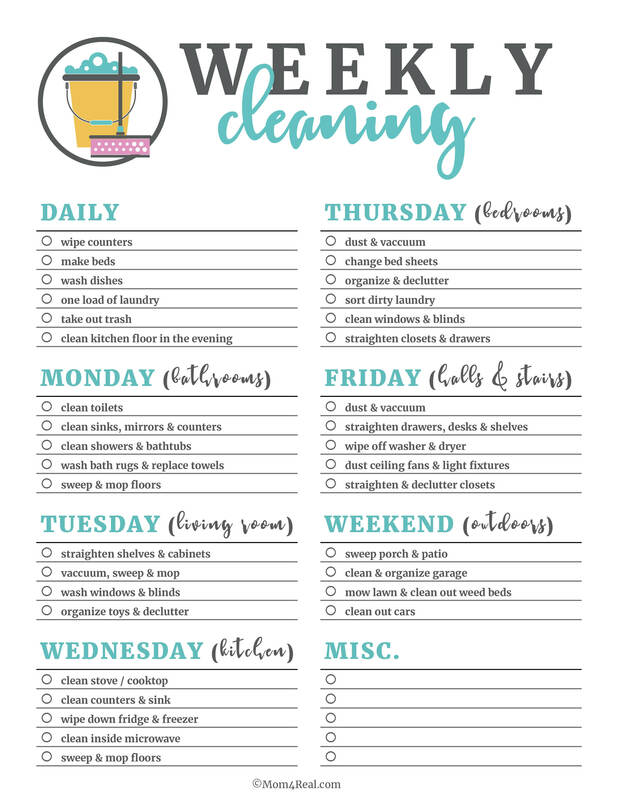 This weekly cleaning checklist is probably my favorite! It’s a nice reminder that if you just take 10 minutes a day to tackle one room, your house will stay so much cleaner. Getting on this schedule helped me keep from getting overwhelmed with keeping our home clean in a major way. I also found that after a couple of weeks, it took me less time to get things done because nothing was really that dirty now that I was keeping up with it. I cannot stress how much less anxiety I have since I’ve kept things more clean and tidy. You’d be so surprised at how much more calm everything seems when your home is clean! 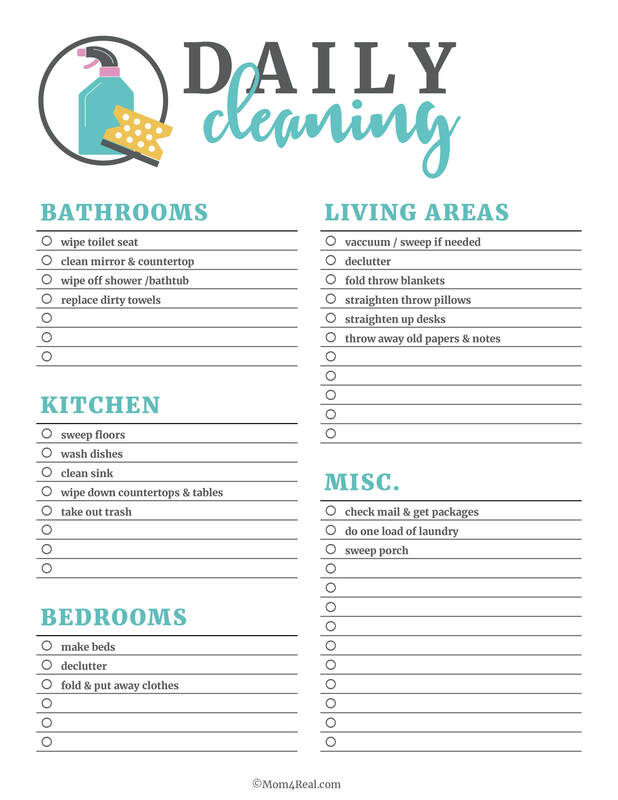 The Monthly Cleaning Checklist is great for knocking out some of the items that we don’t need to clean as often and may have forgotten about. I try to tackle one of these things each day or maybe a few each weekend when I’m not as busy. Some of these things get done every other month instead of monthly, and that’s ok too. Like I mentioned before, these checklists are more of a guideline than a must do. And…you don’t have to do them all of yourself! Enlist your family to help check things off of the lists. Now that you have your cleaning checklists, you may be wondering how to go about cleaning all of the things on your lists. No worries, I’ve got you covered! I’ve covered most of the items on the checklists to make things as easy as possible! 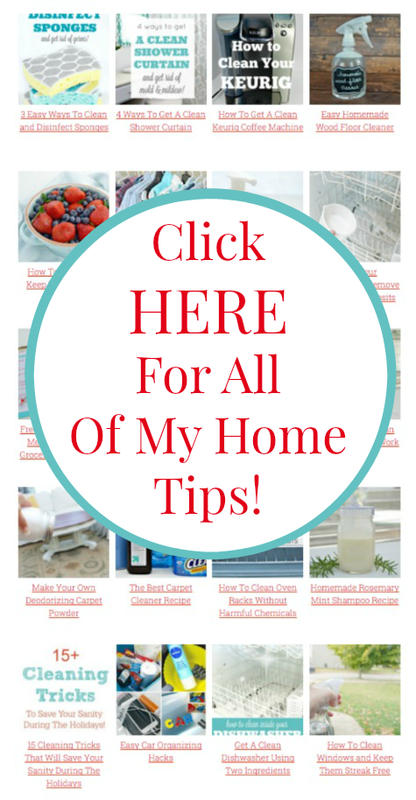 If you are a long time Mom 4 Real reader, then you may have read most of my Cleaning Tips and Tricks. If you are new here, this is where to start! 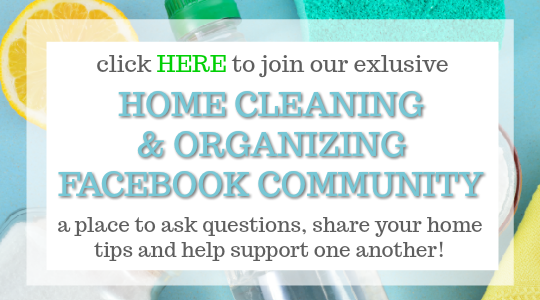 Check out my Home Cleaning Tips and Tricks HERE for hundreds of easy home cleaning hacks, homemade cleaning solutions and home organization tips! I’m so glad you like them, Esther! I love this. Do you have an editable version? Thanks! Hi dear, is there an editable version? What font did you use for “cleaning” and the subheadings on the weekly checklist? Is there an editable version of this as some of these things don’t apply to my house? I’m sorry, but an editable version is not available.